Janice Arnold’s striking felt, silk and jute door panel conjures the rich and vibrant history of both contemporary and historic tentage traditions. The panel was part of a large-scale installation entitled The Palace Yurt, commissioned by Cooper Hewitt for the 2009 exhibition Fashioning Felt. During research trips to Central Asia and Mongolia, Arnold became fascinated by the trellis tents of Kygyzstan (boz üy) and Mongolia (ger). Intrigued by tales of Chinggis Qan, whose tents were said to hold over 1000 men, she began drawings for The Palace Yurt. In 13th century Mongolia, the oversized traditional door flap was associated with kingship both symbolically and literally. Constructed of felt and hung over the sacred threshold it separated the world of the nobility from that of the outside world. Traditionally felt is produced by wetting, agitating, and shrinking tangled masses of wool fibers. Arnold utilized a contemporary technique to create her door panel in which she felted the fibers into a woven substrate. 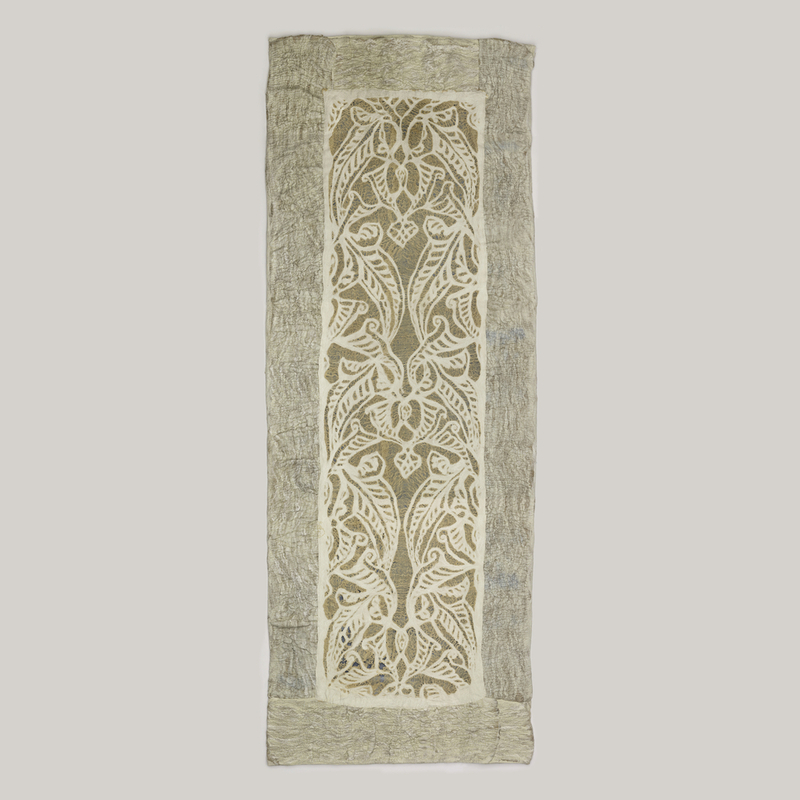 The richly patterned surface calls forth symbolic references to gold and silver-plated thresholds and doorways, which designated rank among the Golden Horde. Throughout the Chingissid, Timurid, and Ottoman eras and the transition from pastoral nomadism to urban settlements, tent culture remained. In the 15th century, Tamerlane built the monumental Bibi Khanum mosque and the Gur i Mir mausoleum complex with carved bricks and glazed tiles in Samarqand, but retained the royal tent complex which was both functional and ceremonial. Ruy Gonzalez de Clavijo, the Spanish ambassador of Henry III of Castile to the court of Tamerlane, described the manner in which decorative fabric enclosures simulated city walls surrounding the royal tents, providing both privacy and protection. In 16th century Istanbul, the imperial tent complex of Sultan Suleiman the Magnificent, an exact replica of the court at Topkapi Palace, was used to establish encampments during military campaigns as the Sultan and his army moved throughout the empire. Constructed completely of textiles, architectural ornamentation was embroidered, appliqued, and couched. A designated corps set up the tents in advance of the Sultan’s arrival, while others were employed to mend and maintain the structures and their contents. In addition to the palace of the Sultan and his retinue, there were kitchen tents, toilet tents, a tower of justice, and even an executioner’s tent, all situated in precisely the same formation as they were at Topkapi in Istanbul. The Imperial Tent complex, “Nuzhet Asrar al-Ahbar der Sefer-I Sigetvar”. In Nurhan Atasoy, Otağ-ı Hümayun: The Ottoman Imperial Tent Complex (Istanbul: Aygaz, c2000) 59. Allsen, Thomas T. Commodity and Exchange in the Mongol Empire, (Cambridge: Cambridge University Press, 1997) 51. Atasoy, Nurhan, Otağ-ı Hümayun : The Ottoman Imperial Tent Complex (Istanbul: Aygaz, 2000) 51.